Photographed at its original location on Florence State Park Marina Road. 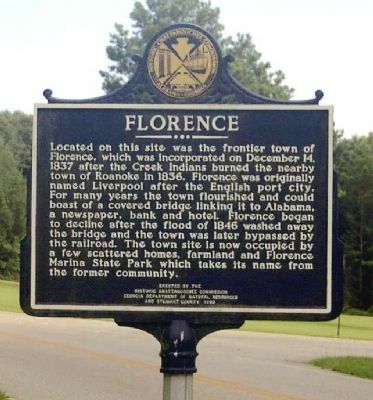 Located on this site was the frontier town of Florence, which was incorporated on December 14, 1837 after the Creek Indians burned the nearby town of Roanoke in 1836. Florence was originally named Liverpool after the English port city. For many years the town flourished and could boast of a covered bridge linking it to Alabama, a newspaper, bank and hotel. Florence began to decline after the flood of 1846 washed away the bridge and the town was later bypassed by the railroad. The town site is now occupied by a few scattered homes, farmland and Florence Marina State Park which takes its name from the former community. Erected 1992 by Historic Chattachooche Commission , Georgia Department of Natural Resources, and Stewart County. Location. 32° 5.299′ N, 85° 2.5′ W. Marker is in Florence, Georgia, in Stewart County. Marker can be reached from Florence State Park Marina Road west of Georgia Route 39, on the right when traveling west. Touch for map. Marker is behind the interpretive center. Marker is in this post office area: Omaha GA 31821, United States of America. Touch for directions. 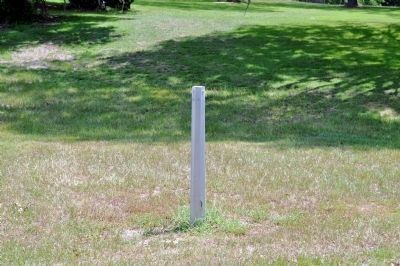 The pole on which the marker formerly stood. It was subsequently moved to this location. marker, measured as the crow flies. Battle of Shepherd’s Plantation (approx. 1.1 miles away); Fort Jones (approx. 2 miles away); Roanoke (was approx. 2.7 miles away but has been reported missing. ); Fort McCreary – 1836 (approx. 4.1 miles away); Indian Trail (approx. 5.4 miles away); Providence United Methodist Church (approx. 7.7 miles away); Rev. David Walker Lowe (approx. 8.1 miles away); Glennville (approx. 8.3 miles away in Alabama). More about this marker. It was originally located near 32° 5.29′ N, 85° 2.551′ W., on Florence State Park Marina Road 0.1 miles west of Georgia Route 39, on the right when traveling west. In was likely moved to this location around 2011. More. Search the internet for Florence. Credits. This page was last revised on January 5, 2019. This page originally submitted on August 6, 2008, by David Seibert of Sandy Springs, Georgia. This page has been viewed 1,244 times since then and 22 times this year. Last updated on August 20, 2011, by David Seibert of Sandy Springs, Georgia. Photos: 1. submitted on August 6, 2008, by David Seibert of Sandy Springs, Georgia. 2. submitted on August 20, 2011, by David Seibert of Sandy Springs, Georgia. • Bill Pfingsten was the editor who published this page. Editor’s want-list for this marker. Photos of marker at new location • precise map coordinates • Can you help?